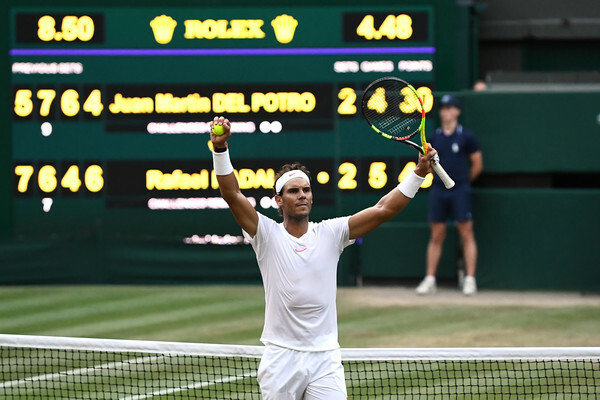 World number one Rafael Nadal needed the full five sets to survive a slugfest with Juan Martin del Potro and advance to the Wimbledon semifinals for the first time in seven years. 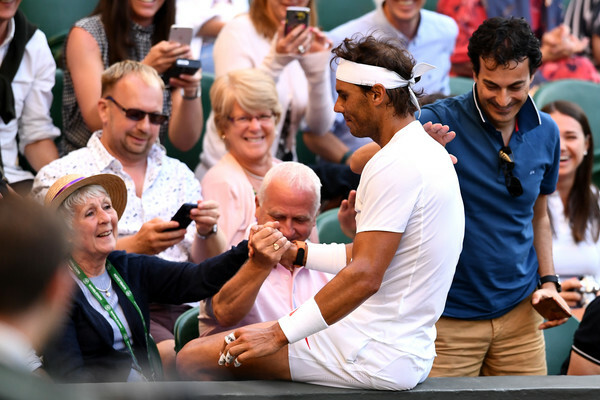 A little over ten years after Rafael Nadal won a match for the ages in near-darkness to claim his first Wimbledon title, the Spaniard closed to within two wins of a third crown at the All-England Club in eerily similar fashion. 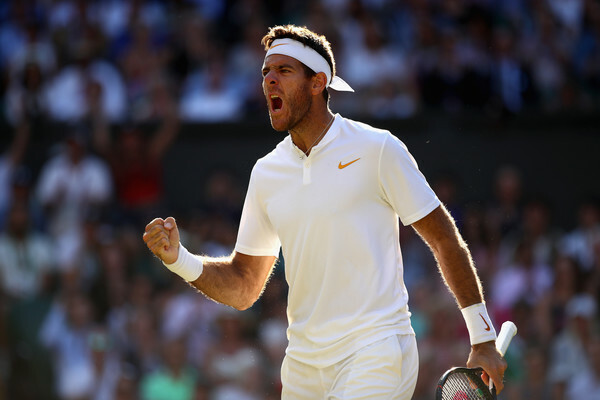 The world number one defeated fifth seed Juan Martin del Potro 7-5, 6-7(7), 4-6, 6-4, 6-4 to advance to the Wimbledon semifinals for the first time since 2011. In a quarterfinal for the ages, Nadal and del Potro traded baseline blows for four hours and 47 minutes, one minute less than that epic 2008 final between Nadal and Roger Federer. There was barely anything between the men for practically the entire match, but it was the world number one who stubbornly refused to break under an Argentine onslaught, hanging on to book a blockbuster semifinal with an old rival. Despite being the more rested of the two, it was the world number one who got off to a slightly sluggish start, falling behind love-30 to start the match. However, it seemed to serve as a wake-up call for Nadal, who rallied to win the next four points in a row to hold serve. 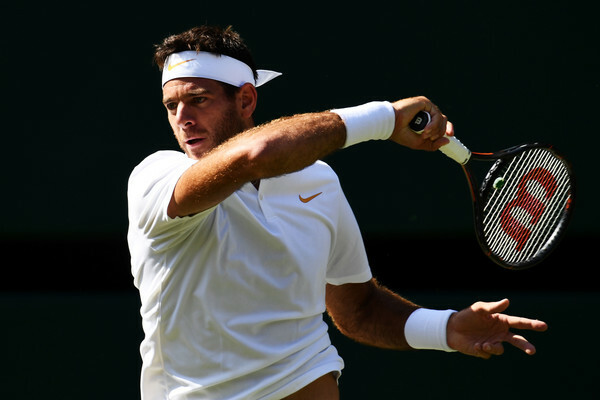 Del Potro was playing for the third day in a row after his round-of-sixteen match needed to be completed on Tuesday, so getting off to a quick start was key for the Argentine. But after Nadal rallied in the opening game, the 2009 US Open champion quickly found himself on the backfoot in the match. He faced his first challenge on serve in the fourth game when he needed to battle through deuce to hold. Nadal was dictating the pace of the match, taking everything the del Potro forehand could throw at him and redirecting it all over the court. At 3-4, the Argentine sent a forehand into the net to set up a double break point for Nadal. 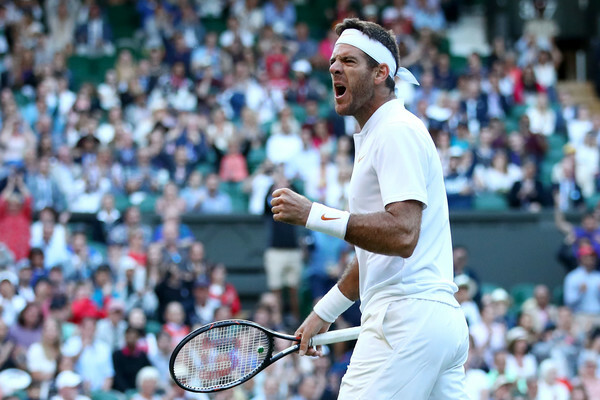 However, del Potro flexed his muscles, saving the first break point by running the Spaniard ragged with his huge groundstrokes before drawing an error to save the first, then saved the second with a monster serve. Despite defending his own serve, del Potro could not make any inroads on Nadal’s, which kept the pressure on the Argentine. That came to a head at 5-6, when del Potro netted a forehand to give Nadal a break/set point. The world number one sent his return long but followed it up with a forehand winner down the line to get a second look. This time, del Potro sent a backhand into the net to surrender the opening set. The second set was a shootout, with both men trying to use their big groundstrokes to bully the other around the court. Neither faced much pressure on serve until 4-all on Nadal’s serve. The Spaniard fell behind love-30 and appeared to go down love-40 when a del Potro backhand caught the baseline drawing an error. Nadal would challenge, and Hawkeye showed the ball landed out, but two points later he netted a forehand to go down 15-40. The Spaniard missed another forehand to put del Potro within a game of the set. Looking to close it out, the Argentine blinked. 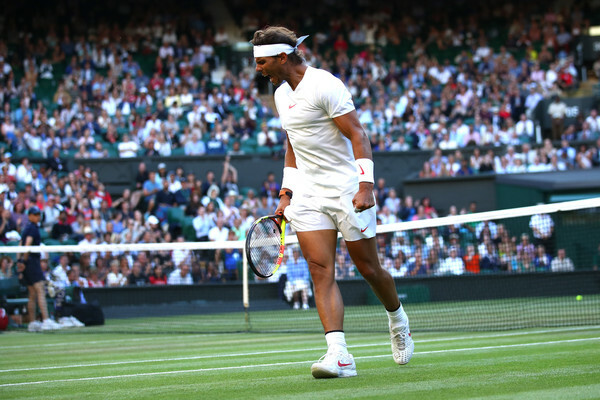 Nadal battled to 30-all and his wild return stance variation seemed to get in his opponent’s head as del Potro double-faulted to go down break point. At 30-40, the world number one ripped a forehand winner up the line to reclaim the break immediately and level at 5-all. Early in the tiebreak, Nadal’s laser vision had a major influence. It appeared that he had given away an early minibreak with a double fault on the first point, only for the Spaniard to challenge and Hawkeye showed the second serve caught the that. Del Potro missed his return on the replay. 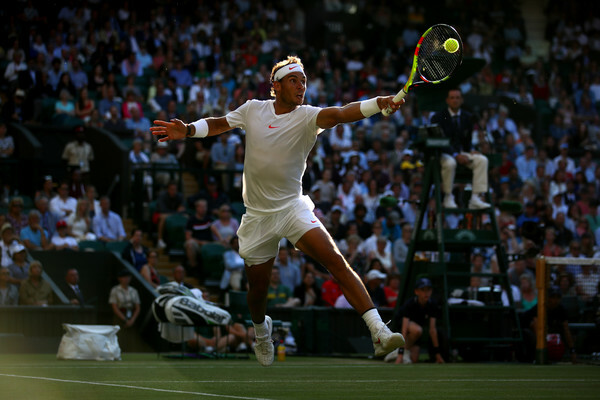 Nadal quickly claimed a minibreak for a 2-1 lead with a wide return and consolidated when he stopped a point to challenge a del Potro shot that Hawkeye showed had landed long. The world number one seemed on the brink of a stranglehold when he went ahead 6-3. 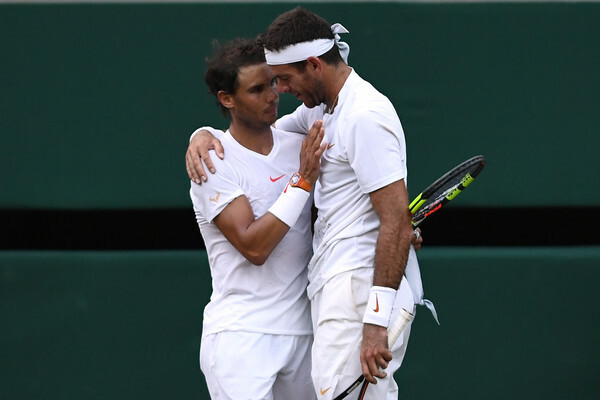 Del Potro saved the first two set points on his own serve and with the set on his racquet, Nadal blew the lead by double faulting his third chance away. The second seed won the ensuing point and had a fourth set point, but again del Potro saved it with a big serve. The Argentine the set up a set point of his own and a friendly net cord helped draw an error from Nadal to give the breaker to del Potro 9-7 and level the match. The third set followed almost the exact same script as the second, with both men cruising through their service games. Nadal was not shying away from del Potro’s big groundstrokes and was doing a good job of pushing the 6’6 Argentine around the court. But when he had a chance, del Potro was unloading his forehand and sending his opponent scrambling. Seemingly out of nowhere, Nadal fell apart as he served to stay in the set at 5-4. At love-15, the world number one attempted a serve-and-volley but sent his volley into the net. On the next point, a series of smashes from the Argentine set up a love-40 triple set point opportunity. Del Potro took full advantage, blasting a massive forehand right off the baseline to claim the break and a two-sets-to-one lead. Unlike the previous three sets, the fourth was effectively decided early on. At 2-2, after both men dominated their first two service games, the Argentine suffered his first major lapse of the match. Del Potro was struggling to stay on his feet, twice falling during the game, and committed back-to-back unforced errors to go down love-40. On the first break point, after falling and getting back to his feet, the Argentine sent a forehand passing shot wide to surrender the break. Also unlike the previous two sets, there were no sudden collapses from Nadal. The Spaniard held his ground to take a 3-5 lead where he had a chance to close out the set on his opponent’s serve. Nadal held set points at 30-40 and 40-AD but netted a backhand on the first and del Potro saved the second with a forehand winner. Despite failing to break, the world number one was undeterred, taking a 40-love lead in his next service game and ripping a backhand winner on the second set point to send the match to a deciding set. The tone for the fifth set was established in the third game on the Argentine’s serve. Del Potro had to do everything to survive the game, even diving at the net multiple times. That game had everything, including multiple deuces and Nadal jumping into the crowd after chasing a ball down. But in the end, the Argentine held without facing a break point. 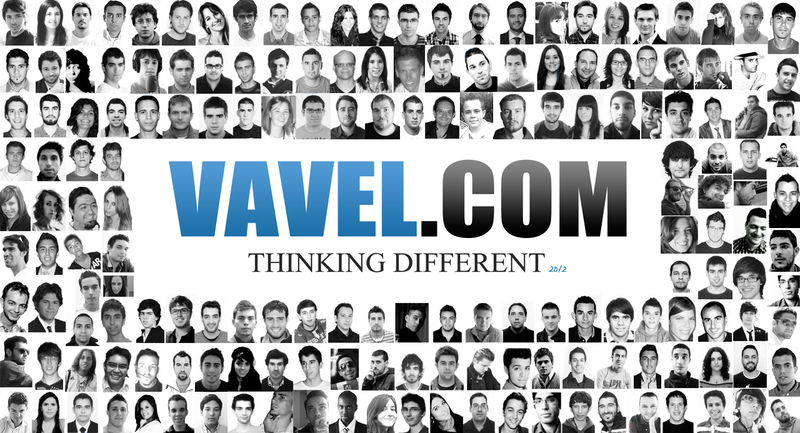 But Rafael Nadal never goes away. In del Potro’s next service game at 2-2, the Argentine sent a passing shot long (despite Nadal falling at the net) to set up double break point. The Spaniard slipped again on the first, allowing for an easy forehand winner for del Potro, but ripped a backhand winner crosscourt on the second to grab the decisive break in the final set. Del Potro did everything he could to get the break back. His first chance came in the following game when Nadal sent a forehand long at 30-all to set up break point, but it was Nadal being rewarded for some great defense when del Potro shanked an easy forehand with Spaniard well off the court. The Argentine had a second chance after Nadal netted a forehand, but the world number one would save it with a massive forehand winner, going on to hold. The 2009 US Open champion was throwing everything at Nadal, including on defense. After failing to get the break back, he avoided a deeper hole when he won four straight points from love-30 down on his own serve to keep it at one break. 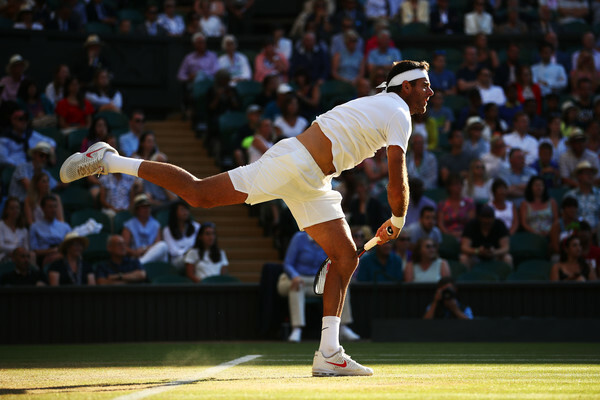 The eighth game would prove to be one of the great games in Wimbledon history. Both men were playing at an exceptionally high level, crushing highlight reel shot after highlight reel shot. Nothing was coming easily, as the game needed multiple deuces. Del Potro got his first look at a break point when one of his massive shots caught the baseline for a winner. He went all out to convert but literally fell just short as his diving volley found the net. Del Potro kept coming, using some huge hitting to set up another break point, only for Nadal to step up with some stellar defense that eventually drew an error. A backhand long from the Spaniard provided a third break point, but del Potro misfired his forehand well wide. Finally, on his fifth game point, Nadal curled a forehand winner up the line that caught the corner to move the world number one within a game of victory. Despite still being behind, del Potro would not go away, holding to love to force Nadal to serve out the win. Just like the rest of the set and the match, the final game was a slugfest. Del Potro got as close as 30-all, but he sent his forehand wide to give the second seed a match point. Nadal went for the quick finish, putting away a textbook serve and volley to close out a win for the ages. Del Potro mostly did what he needed to do, going big at every opportunity and found the target often, winning 77 percent of his first serve points and striking 77 winners, including 33 aces. However, defense wins championships. Nadal, who was also solid on serve with 74 percent of first serve points won and had 67 winners of his own, won 50 percent of del Potro’s second serve points and only committed 34 unforced errors to the Argentine’s 52. Where Nadal’s defense may have been at his peak was at break point. Through four sets, he managed to limit del Potros’ opportunities, only facing two, although the Argentine converted both. In the fifth set, the world number one saved all five break points he faced. On return, the Spaniard converted four of his ten break points. Anyone who questions Nadal’s volleying skills should have been watching this match. The Spaniard attacked the net 47 times in the match, winning 36 of those points. Nadal’s semifinal is already being considered the unofficial final. There, he will meet an old rival who defeated him the last time he advanced past the fourth round at Wimbledon in 2011. The semifinal on Friday will be Nadal-Djokovic LII as the Spaniard will meet a resurgent Novak Djokovic at a major for the first time since the 2015 French Open. Nadal will be looking to level their head-to-head at 26-all and has won their last two meetings, both on clay. 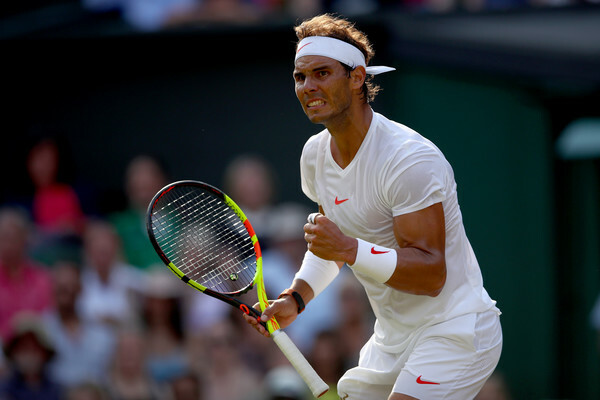 Nadal leads their head-to-head on grass 2-1, having split their previous Wimbledon meetings. However, Djokovic won their most recent meeting at the All-England club back in the 2011 final. The world number one has not beaten the Serb off of clay since the 2013 US Open final.